Need to stock your pantry and fridge with the best local food for your holiday meals? Looking for unique gifts that your friends and family won’t find online or at the mall? The Barrie Farmers’ Market has what you need. Celebrate the holidays with us! Take care of your holiday shopping and earn ballots toward weekly draws for holiday prize bags. 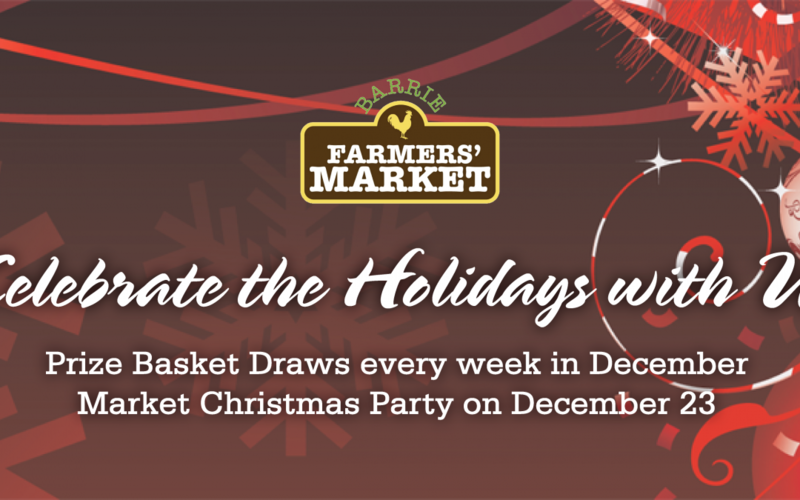 At every market in December you can win a Barrie Farmers’ Market prize worth over $300 in food, artisan gifts, vendor gift certificates, and market money. Draws will happen every Saturday at noon, so come back again and again for more chances to win. The Farmgate Dalston, PJ Meats, Rosie Rain Meat Pies, Home Baking by Linda Desroches, Elegance by the Duo, Grandpa’s Hungarian Sausages, Homestead Artisan Bakery + Cafe, McBrides Organic Farm, No Wheat Treats – Gluten Free Bakery, Say Cheese, Without Reservations, Beach Baby Bath & Body, Jun’s Roll and Sushi, Carter’s Maple Syrup, Georgian Chocolate Co., Heritage Estate Winery & Cidery, Pillitteri Estates Winery, Turnview Farm Honey, Stone Horse Farm, Heena’s Curry House, Nicholyn Farms, Bark & Mewz, Terry’s Unique Hot Sauce, Carpe Diem Farm, Williams Farm, Green By Hand, Highmark Farms, artist Joan LeBoeuf, Mays Food Service, Meals by Chef Mario aka. Maruzzo’s Personal Chef and Sommelier Service, Adam’s Honey, Northern Kettle Corn, Pleasures & Pastimes, Your Ultimate Meals, Jacobi Crafts, The Gamble Farm – Heritage Free Range Eggs and Organic Vegetables, Kimberley’s Sprouts, In A Nutshell, Egon’s Chocolates, Lotus Natural Living, and Desserts by D. Plus market bucks to spend at the Barrie Farmers Market on whatever you want! Kids can get in on the fun too with a treasure hunt every week. They track down answers as they explore the market and win a seasonal prize. And on December 23, as part of the Market Christmas Party, Katie Green of Green by Hand will have a button making activity on the go. On December 23 we’re having a Market Christmas Party with free treats for our customers. It’s also the last market of the year, so pick up everything you need to tide you over until we’re back again on January 6.